Cloth diapering mamas know that reducing our environmental impact is a major reason for our fluffy love. And that’s a big part of why I was so happy to review this upcycled wool wrap from Lily’s Dreams. I don’t have a whole lot of experience with wool, so I was extra excited to try it out! Wool has some pretty amazing properties. Did you know it’s naturally breathable, water resistant, mildew resistant, antibacterial, and fire resistant? I know wool has a reputation for being hard to care for, but I think it all depends on how you look at it. Yes, it does need to be handwashed, but only if it gets soiled or if it starts to retain smells. Depending on how often you use your wool, this could easily be two to four weeks! In between washes it requires very little maintenance. Just hang it up to dry and air out, and reuse it again and again! Lanolin (the natural oil that creates wool’s water resistance) doesn’t necessarily need to added every time you wash your wool either – just when the wrap starts to leak. Your wool may only need to be lanolized every second or third wash.
Kayla is the owner and creative mind behind Lily’s Dreams. 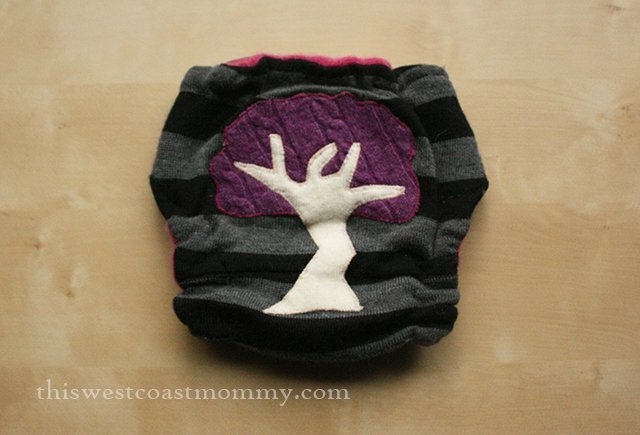 This Canadian mama makes beautiful, eco-friendly, upcycled wool wraps, soakers, longies, and puddle pads. Kayla searches for 100% wool sweaters that have lost that loving feeling and upcycles them into super cute diaper wraps. Then she adds an adorable applique on the bum made from scraps of other repurposed sweaters. Talk about eco-friendly! Kayla began working on her wraps at night after oldest daughter Lily had gone to sleep, hence “Lily’s Dreams”. Now she has two sweet girls, and she’s expecting another baby in May! Both her heavy wetting girls have been cloth diapered since birth, and she chooses mostly wool for them because of its breathability. Ordering my custom wrap was super easy. I sent Kayla an email with the colours I wanted, and she sent me back pictures of all the wool she had in those colours for me to pick from. Kayla regularly goes sweater shopping and loves hunting for just the right sweater to match her customers’ requests. I was able to pick the colours for the outside, inside, snaps, and the applique. Kayla sent me a picture of the completed wrap for my approval before shipping it out. Here’s the custom wrap Kayla made for my baby. The outside of this wool wrap is a bold grey and black striped merino wool, and the inside is fuchsia cashmere. This is seriously the softest wrap I have ever felt. If you’re peeing in your pants, you might as well be sitting in luxury while you’re doing it! The back is elasticized to fit snugly on baby’s waist. There are 4 rows of 2 snaps on the front to adjust the rise and size, and 8 snaps across the front to adjust the waist. Each wing has 2 waist snaps, plus crossover snaps for the skinniest babies. I’m in love with the beautiful tree applique on the bum, also 100% wool. And here’s how the sizes compare. To adjust the diaper to its smallest size, snap the top row of rise snaps into the bottom row. Snap the second row of snaps for the next size up, and the third row for the next size after that. Leave the snaps undone for the largest size. The first thing to understand is that the wrap I received is intended to fit over flats or prefold diapers. I folded my prefold diaper into thirds, just laid it in the wrap, and snapped the whole thing onto Keira. The wool is very stretchy and the elastic is very gentle around Keira’s legs. There was room for another insert if I wanted to add more absorbency. Keira was easily able to wear it for a couple of hours without any leaks. I didn’t test this wrap overnight as the lightweight unfelted wool in this particular wrap was designed for daytime use or naps, not a 10 hour stretch overnight. Having said that though, one afternoon Keira fell asleep just as I was about to change her and ended up wearing the wrap for four hours. That’s way longer than I would usually leave her in any daytime diaper. I thought for sure she’d be soaked and even tucked a towel under her just in case, but when she woke up I was amazed to find her clothes were still dry! The outside of the wrap felt just barely damp to the touch, even though the prefold inside was almost completely saturated. I find it so cool that this non-plasticized and completely breathable fabric can keep the wetness in so well. Remember when I said wool was fairly low maintenance between washings? Well, I haven’t had to wash or lanolize this wrap despite using it more than half a dozen times. Not bad at all! When I first picked it out, I didn’t realize that this wrap was designed to fit over padfolded flats or trifolded prefold diapers. The crotch is on the narrow side as are the wings which made it too trim to fit over my fitted diapers. 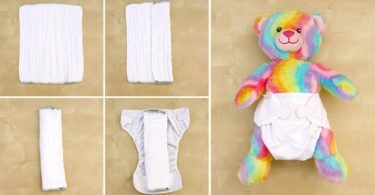 But not every mama wants to use flat or prefold diapers. I personally find padfolded flats and prefolds shift too much and bunch up between chubby legs, making them my least preferred cloth diapering option. When I contacted Kayla to let her know my fitted diapers didn’t fit inside the wrap, she immediately went to work adjusting her design with wider wings and a wider crotch to accommodate. I haven’t had a chance to test the new design, but here’s a picture showing the difference so you can see that they should fit nicely over a typical fitted diaper now. I am so impressed with Kayla’s commitment to continuously improving her items! The other thing I noticed was that the snaps on my wrap were not perfectly spaced apart, but the stretch of the wool is very forgiving and the functionality of the wrap is not affected at all. This is a handmade item, and you can’t see those snaps when the wrap is on so it’s not a big deal to me. I don’t normally use padfolded flats or prefolds, so next time I would select the newer wrap design with a more generous cut to accommodate my fitted fluff. However, mamas who do appreciate the simplicity of just laying a flat or prefold in a wrap and snapping it up can always request the original design. Either way you’ll get all the benefits of natural, breathable, eco-friendly wool and a beautiful one of a kind wrap handmade with love. Take a look at some of the other wooly items at Lily’s Dreams! Connect with Kayla at Lily’s Dreams on Etsy and follow on Facebook for the latest news, specials, and discounts. Go shopping at Lily’s Dreams for a custom, one of a kind wool wrap or have Kayla custom make a soaker or pair of longies just for you. Soakers without an applique start at $18.00, longies start at $23.00, and plain wraps start at $26.00. Trust me, go for the applique. It’s totally worth it! Lucky you! Kayla is offering a special 10% discount code to my readers. Just enter code BLOGHOP10 at the Etsy checkout. The code is only valid until November 30 though so don’t miss out! And here comes the best news of all! Come back next week for my giveaway in the Ditch the Disposables Hop where you could win any in stock wool wrap or diaper cover (longies too!) from Lily’s Dreams. Disclosure: I received a sample item for review purposes. All opinions expressed are completely honest and my own, based on my personal experience. Your experience may differ. Aww they are adorable! They look really soft, too. Mine has cashmere on the inside. Softest ever! Oh my gosh her wool is ADORABLE! I had never heard of this brand, and now I have to go check them out 🙂 I love the new one you got, with the bird on the toosh! Too cute. I do really love flats and prefolds so I know I would really enjoy the wrap also. Thank you for sharing! thanks for the intro – really like her stuff! Wow! 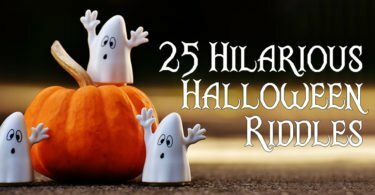 Lily’s Dreams creations are so cute! 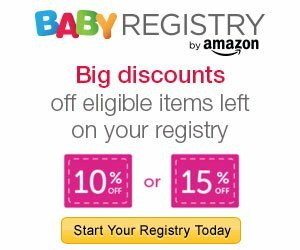 I would love to try it for my two month old baby boy. I love the One Size Wool Cloth Diaper Cover/Wool Wrap – Grey and Blue with an Elephant Applique it looks so cool. One Size Wool Cloth Diaper Cover/Wool Wrap – Blue and Yellow Stripes …so cute. Love the wrap with the heart applique on the bum! That should be BLOG, not log! I really like the Upcycled One Size Cashmere Cloth Diaper Cover/Wool Wrap/Soaker – Light Blue with a Tree Applique and the upcycled wool mattress pads!!! such great products! I like the navy blue and green striped merino wool wrap. I love the Newborn Size Upcycled Wool Soaker with Added Doubler in Wetzone – Nautical Blue and White Stripes Boat Applique. what adorable diapers. My favourite is the Size Newborn Upcycled Wool Diaper Cover/Soaker/Shorties/Longies with Added Doubler in Wetzone/Bird Applique, amazing! This large Upcycled Soaker/Diaper Cover/Shorties with an Extra Layer in the Wet Zone – Bright Blue and Green with Argyle Music Applique is so cute! I like the Patchwork/Scrappy Blue and Green Stripes OS cover. What a good idea to have rise snaps on a wool cover! That extra bulk is just where a little boy needs it! I love the Upcycled One Size Wool Cloth Diaper Cover/Wool Wrap/Soaker – Teal and Purple with a Bird Applique. It’s so unique! These are are soo cute!! 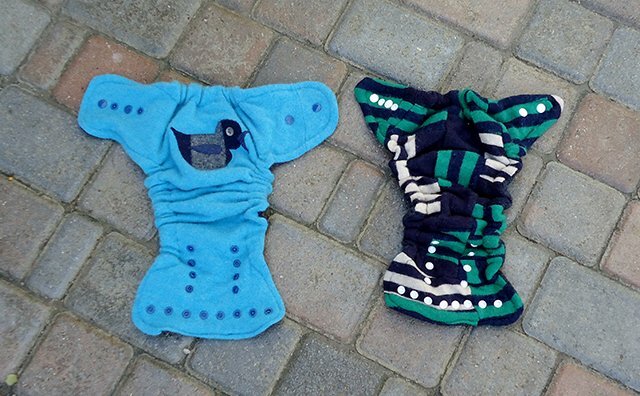 I really like the One size wool cloth diaper with Patchwork/Scrappy Blue and Green Stripes. Love her wraps! I’ve been saving to buy my first wool wrap from her store! I like them too! Please don’t forget to answer the question in order to collect the entry. 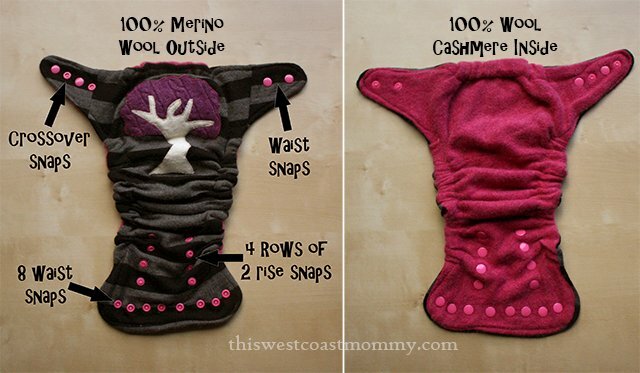 The Upcycled One Size Cashmere Cloth Diaper Cover/Wool Wrap/Soaker looks so luxurious! I do like the tree so cute and I also like One Size Wool Cloth Diaper Cover/Wool Wrap with Tan and Butternut Yellow Diamonds. so many cute thing on the web page. I like the navy blue and green striped wool cloth diaper! I love the large upcycled soakers….beautiful, and hard to choose just one! Oh wow! Those are adorable!! I love the pattern on this Tan and Butternut Yellow Diamond wool wrap…. the Musical note appliques are really sweet too! They are adorable! Please don’t forget to answer the question in order to get the entry. I have never tried wool before, but I am very intrigued! Wool is such a fantastic material! Please don’t forget to answer the question in order to collect the entry. I love the Rubber Ducky applique on the One size Wool Cloth Diaper Cover 🙂 Very cute. So cute! The one with the elephant is my favourite! I really like this item: Organic Hybrid One Size Wool Cloth Diaper Cover/Wool Wrap – Thick Grey and Blue Stripes. I love the One Size Wool Cloth Diaper Cover/Wrap with Teal, Green and Black Stripes! its SOOO adorable! so hard to choose just one favorite! I love the upcycled wool one size wrap in the argyle print! So cute! I like the-Size Newborn Upcycled Cashmere Wool Diaper Cover/Soaker/Shorties/Longies with Added Doubler in Wetzone/Bird Applique. Love this! I’ve been toying with the idea of checking out a wool cover (to go with a fitted that I just bought for nighttime)! So cute! Good luck! Please don’t forget to answer the question in order to collect the entry. Love the blue and grey stripes!